And Jamal Abu, a black student at Dallas Chinese School, started taking algebra classes there after his mother determined he needed extra help. Jamal, a freshman at John Horn High School in Mesquite, said he’s performing better as a result of his weekend classes. 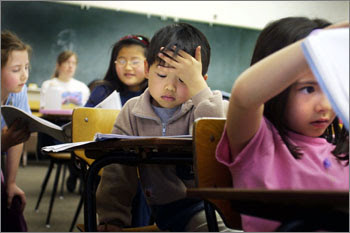 And it doesn’t feel weird to be a non-Asian at Dallas Chinese School, he said. “There’s no stereotype, as long as you just don’t be making fun of Chinese people, because Chinese people are kinda cool,” said Jamal, 14. Somebody give this kid a TV network to run.